Every now and then a needlepoint accident happens—you get distracted while clipping thread ends, and before you know it, you've cut a canvas mesh thread as well. Your first reaction is to panic, or if you're well along in stitching your project, you may even experience outright despair! What Should You Do When This Occurs? First, take a deep breath. You certainly don't want to start stitching the needlepoint project all over again—especially if it is nearing completion. Luckily, any cut threads or holes in needlepoint canvas can be repaired quickly and easily by following these simple steps. Although there are a few other ways to repair damaged needlepoint canvas other than the one demonstrated here, this method works the best by far and results in a strong repair that can stand up to repeated use. If you do the repair the right way, you'll save time, effort, money, and frustration in the long run. This repair method is successful with small holes like the one shown in the image above, as well as larger holes or cuts in single thread, Penelope and some types of novelty needlepoint canvas. When using this process, extra patience is required. This means you must first get over the emotion of having mistakenly cut the canvas before you start the repair. The following steps, if followed carefully, will allow you to successfully repair any hole in needlepoint canvas. However, before starting the process, it is really important that you read through all the steps at least once to better understand what is needed for a successful canvas repair project. Prepare the canvas for repair by trimming the mesh threads around the hole. Snip away any warped or split threads as well as those that are sticking out. Depending on your eyesight and the mesh size of the needlepoint canvas, you may need to use a magnifier to assess the full damage and be able to see all the loose threads. Align the canvas threads in the patch with the damaged canvas area, and baste the patch to the wrong (back) side of the hole by hand with sewing thread. If you don't know how to sew, you can use a very small dab of fabric glue and let it dry thoroughly before continuing with the repair. Tiny holes can be easily repaired by holding the canvas patch in place with your finger on the backside of the canvas as you stitch. Resume working the needlepoint project as if the patch were not there, stitching over the double layer of canvas as if it was one piece. If the needlepoint design calls for working the Tent Stitch, you can anchor the canvas patch by stitching around the edges of the patch before filling in the remaining stitches. That's all there is to it! It's even easier to repair canvas threads you may have accidentally clipped when ripping out needlepoint stitches. Use these steps for even quicker and easier repairs. Remove a long thread from a piece of blank canvas that's the same mesh as the one needing repair. Thread it into a tapestry needle and begin to weave the thread in and over the areas where the canvas was cut. 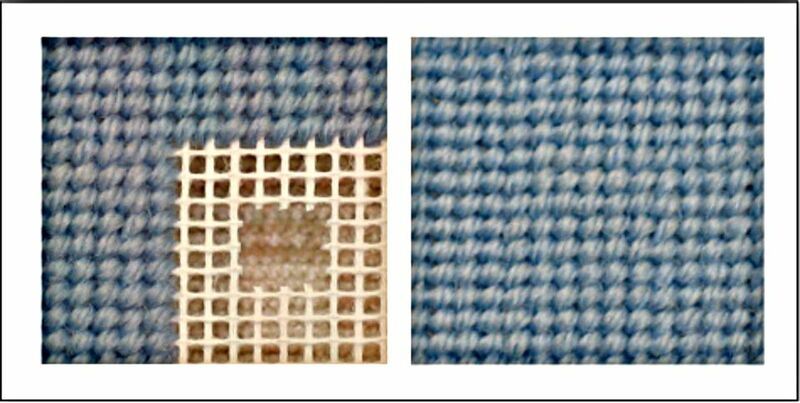 Use magnification to see the direction of the weave of the cut canvas thread, and match this direction as you repair it. Cut the thread, leaving a small tail (there should be no knots). When you start stitching the needlepoint design again, carefully work over the double threads and small tails at the beginning and end of the repair area to secure the damaged canvas.